How have you all been? In the UK, this term is all about exams and deadlines. I've completed my final year exams 2 weeks ago and am currently doing my research project at the Warwick Crop Centre. It's been very busy for me since the start of Easter break. I hope everyone has been taking care of their health and sleep lately, and I pray that all your hard work will pay off (InsyaAllah). Today's look is based on my back to school / exam look. The title is called "3 in 1: because it is all about one main look which can be worn for 3 ways. This is what I wore during my first day of exams. I have been putting off folding my clean laundry and did not want to waste any time digging through the laundry basket, so I decided to wear something out of my 'nice clothes' closet space instead (I have a section of my closet where I hang only my OOTD worthy clothes haha - am I the only one who does this? I beg to differ). I was actually saving this for a day out, but since I have been a disorganised lady, I didn't have much choice but to dress up. The main element of this outfit is the trousers. The pleats give it a classy and formal look while the high waist and relaxed fit is playful, casual and most importantly, comfortable for those long sits in exams. I paired this with a turtle neck crop top because I know how cold the exam rooms usually are. As an outer, I chose this oversized duster coat to complete the whole outfit. A duster coat can add sophistication to your look, it is also lightweight enough to give you that extra bit of warmth when you need in the exam hall. Because the trousers are also cropped, I chose my Timberland ankle booties. A must for exams is a watch to keep track of the limited time you have in answering questions. I myself prefer digital watches for exams because it is quicker to read and has the easy timer feature. I would use a tote bag because it is relatively faster to take my notes in and out. It is also lightweight and is enough to keep the exam essentials in. 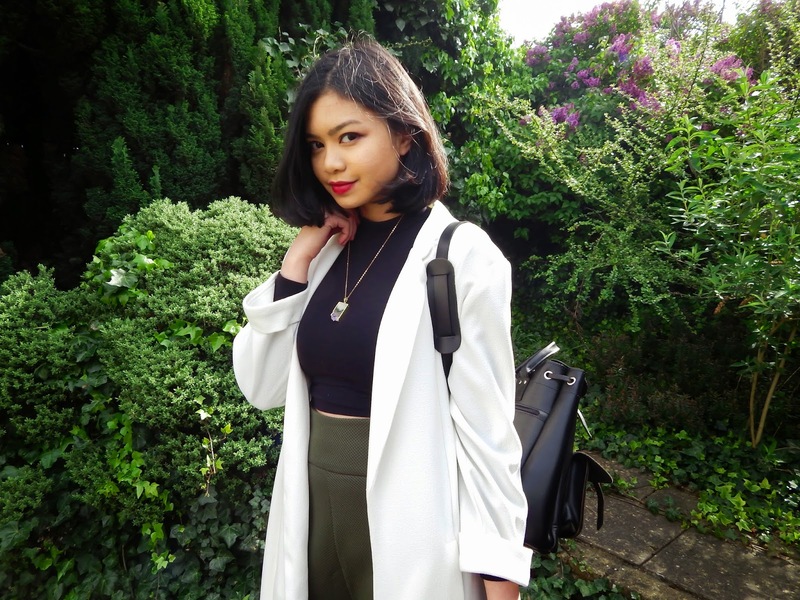 You can turn this into a going out look by wearing your favourite necklace and switch with a casual rucksack! 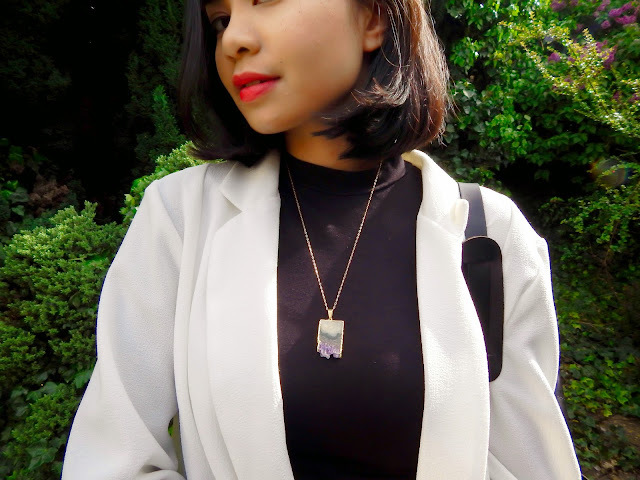 The necklace I'm wearing is the 'Mini Royale' necklace from Enya Bijoux which consists of a beautiful and unique raw amethyst slice pendant. 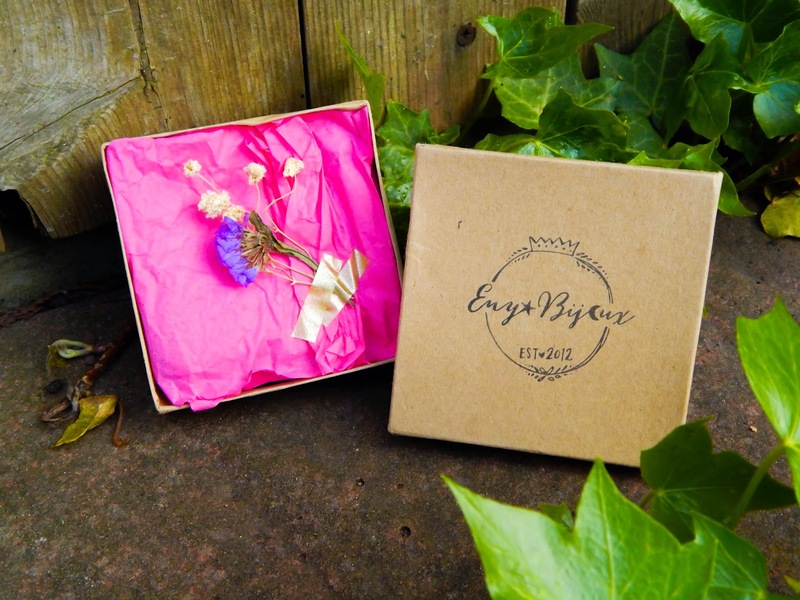 Enya Bijoux is a local Bruneian jewellery design brand. 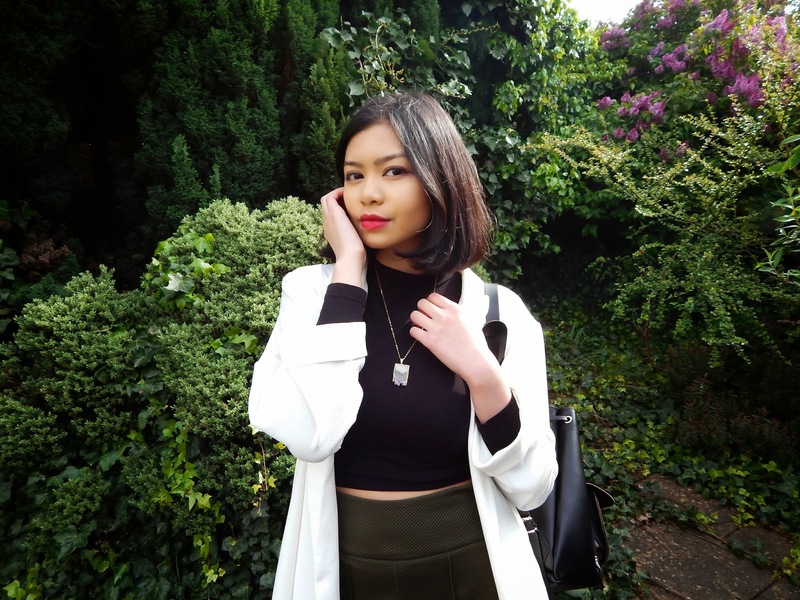 The designer Yusrina, hand makes and designs all the jewellery. I have always adored hand made products because of the personal and nostalgic feel. A rucksack is my go to bag to go for a quick shop or to meet up with friends! Adding the chic to your outfit and big enough to keep the essentials in as well. For the hijab beauties out there, this look can be a hijabi look as well. 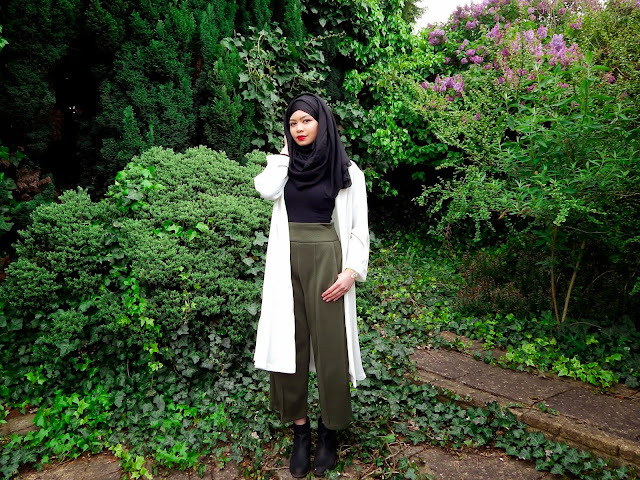 Slip on to your favourite hijab and instead of a crop top wear a long sleeve top of your choice you're good to go! I would recommend to wear longer socks for maximum coverage - although I did not here because I totally forgot about it. You can also wear a statement bracelet to vamp up your outfit. 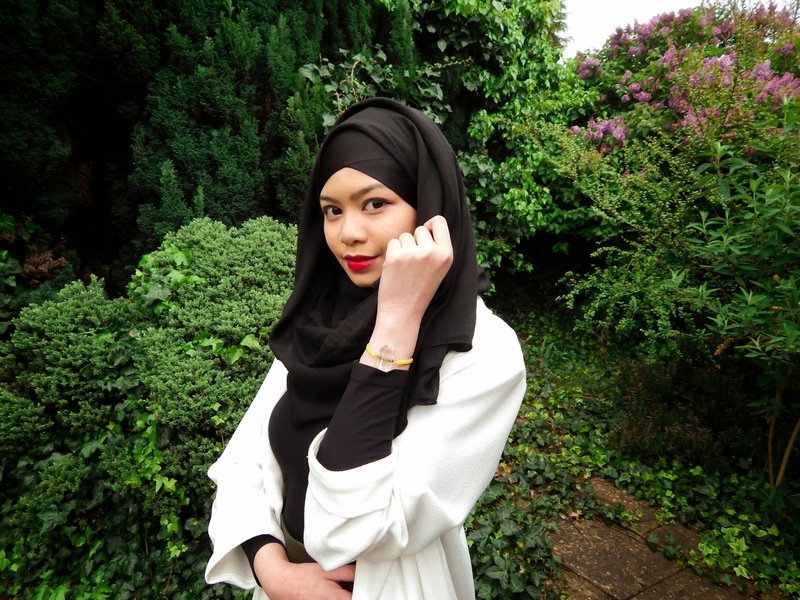 I chose this amazing 'Stella bracelet' from Enya Bijoux for my hijab look. This is a variation of the "STELLA" collection which is featured with macrame cord - a balance of casual and elegance. I would like to sincerely thank Enya Bijoux for gifting Wearrior Instinct with their intricate and beautiful pieces. What I love the most about Enya Bijoux is that they put great care and thought into every detail of their product from packaging to image design and the pieces themselves. I enjoy every bit of the gift and especially how diverse and versatile their pieces are. 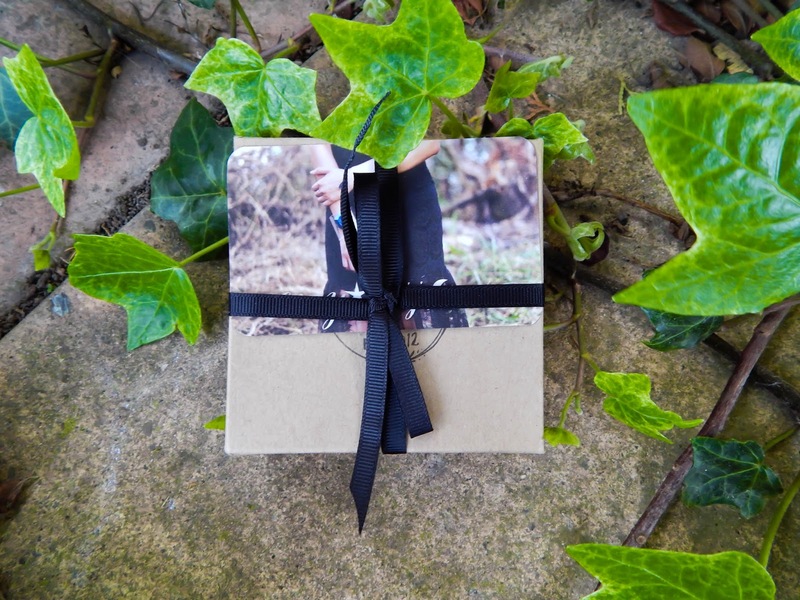 I can't wait to do more posts with their jewellery! Get inspired by following their instagram account @enyabijoux. Get in touch with them at +673-7111427 and if you prefer, you can also follow them on their Facebook page! I hope you like this post and I'll see you soon!